The Evolution 50A sees the start of a new era for Creek Audio. This 55 Watt per channel amplifier continues to deliver Creek’s recognisable high-quality sound whilst maintaining the principle of value for money. 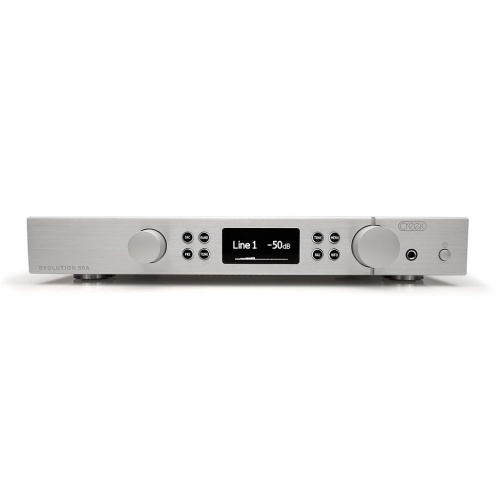 This Integrated Amplifier also includes an FM/AM tuner allowing you to enjoy a wide variety of sources. control knobs, it’s finished in either black or silver brushed aluminium. An ingenious new push button design has been developed for it, offering excellent tactile feel and backlit optical indication of usable functions for optimum user-friendliness. 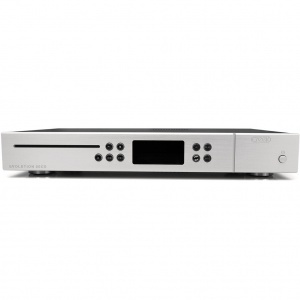 Designed to match the high-end EVOLUTION 50CD DAC/CD/Pre-amp. The 50 series is the first Creek product to feature an OLED (Organic Light Emitting Diode) display. This white on black display provides higher clarity and resolution than a normal display and offers a wide range of customised graphic symbols. Display brightness levels can be changed or turn off when not required via the menu system. At the heart of any good amplifier lies a good power supply; The EVOLUTION 50A uses a massive 200 Watt toroidal mains transformer with separate windings for high and low current analogue and digital circuitry. This produces a good power to weight ratio and low magnetic interference. Creek’s policy of paralleling several low impedance capacitors together, to create an ultra-high specification capacitor, to smooth the DC also helps to produce a very powerful and accurate sound from such a relatively small amplifier. Creek’s Senior Engineer – David Gamble – who has much experience in the audio industry developed a completely new bi-polar transistor power amplifier circuit especially for the EVOLUTION 50A with very high open-loop gain and low distortion. Featuring a pair of Sanken 15 Amp power transistors, with built-in thermal compensation for rapid bias tracking performance, the Power Amplifier circuit has very low output impedance and can produce high output current. This combination will provide exceptional speed and control with most loudspeakers. David also developed a completely new analogue Pre-amp circuit, providing high levels of flexibility and control, via unbalanced or balanced inputs. It has multiple input options, switched electronically or via gold contact relays, plus electronic Volume, Balance and Tone controls. For Vinyl fans, a Sequel 2 Phono pre-amp can be plugged-in, substituting Line Input 1 for Phono. In addition, Line input 5 is located on a Smart- Slot removable panel. Should the user want to fit a Tuner or DAC module, Line 5 input can be removed and replaced by either the AMBIT tuner or RUBY module. Excellent measured and sonic performance has been achieved with this analogue integrated amp, but when using digital input signals via the matching EVOLUTION 50CD, the analogue pre-amp can be bypassed completely. 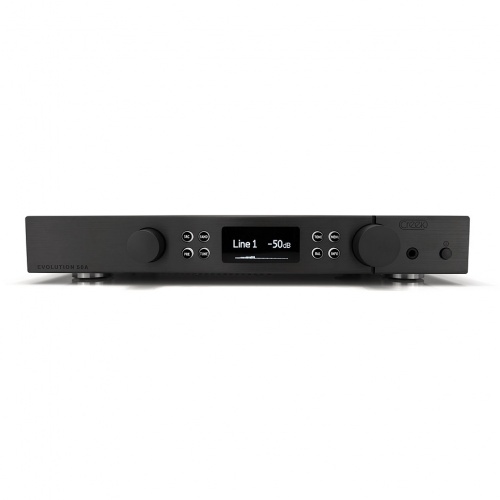 The EVOLUTION 50CD has a very high-end volume control in the digital domain and ‘Class-A’ balanced audio outputs. Connecting the output directly to the “Power amp direct” inputs elevates the performance to an even higher level. Creek Audio no longer makes a separate EVOLUTION Tuner, but die-hard analogue tuner fans can continue to listen using the top quality AMBIT plug-in tuner module, which augments the EVOLUTION 50A’s capabilities. The AMBIT and Ruby modules can be mounted to the back panel ‘Smart-Slot’, replacing Line Input 5. When the AMBIT is fitted, it automatically turns the amp into a Receiver, suitable for use in every region of the world. The OLED shows tuner functions and buttons and knobs have dual functions. Coming soon, the RUBY plug-in DAC module also replaces Line Input 5. When available, it will add 2 x SPDIF, 2 x TOSLINK, USB, Bluetooth and FM radio inputs to the existing 4 line inputs. The EVOLUTION 50A can also be configured for Vinyl Disc input, in place of Line input 1. The SEQUEL 2 module plugs into dedicated connectors on the pre-amp PCB and can run simultaneously with the AMBIT or RUBY. It comes in three versions – 40dB – 48dB and 54dB MM and MC. To simplify the many options a stylish new system remote handset has been developed to control all the functions of the EVOLUTION 50 range. The EVOLUTION 50 range also features an optional IR extender to enable the products to be hidden away, but still operable via remote control.